In the Indian Premier League 2019 (IPL 2019) match 16, Delhi Capitals (DC), formerly known as Delhi Daredevils (DD) take on Sunrisers Hyderabad (SRH) at the Feroz Shah Kotla Ground. Meanwhile, Sunrisers Hyderabad have won the toss and opted to bowl first. Sunrisers are going unchanged in this fixture. Capitals, on the other hand, have made three changes. Check out the live score updates of DC vs SRH here. Delhi Capitals (DC) have managed to win two out of four matches and are currently placed fifth on the IPL 2019 points table. Sunrisers Hyderabad, on the other hand, are third on the team standings with two wins from three matches. Recently, SRH defeated Royal Challengers Bangalore (RCB) by a huge margin and now will be confident of making it three in a row. DC vs SRH, IPL 2019 Live Cricket Streaming: Watch Free Telecast of Delhi Capitals vs Sunrisers Hyderabad on Star Sports and Hotstar Online. Delhi, on the other hand, will be looking to bounce back after the morale sharing defeat against Kings XI Punjab. Meanwhile, this will be the 13th match between the two sides in IPL. Delhi have won four while Sunrisers have emerged victorious in eight. In Delhi, the visitors have managed to win three out of four contests. 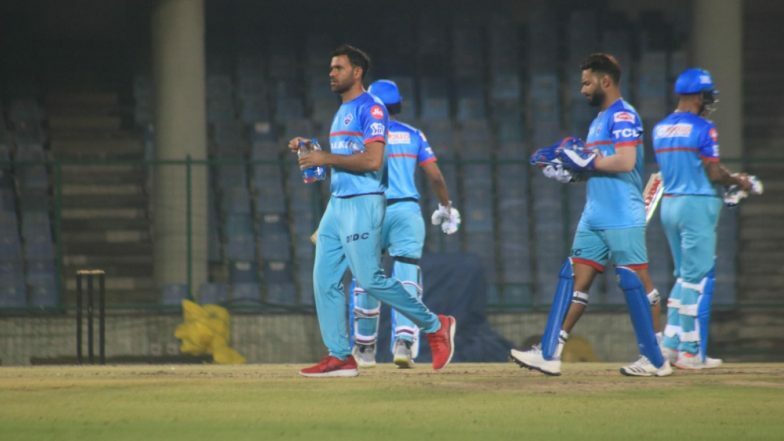 Delhi Capitals Playing XI: Prithvi Shaw, Shikhar Dhawan, Shreyas Iyer(c), Rishabh Pant(w), Colin Ingram, Chris Morris, Axar Patel, Rahul Tewatia, Kagiso Rabada, Sandeep Lamichhane, Ishant Sharma. DC vs SRH, IPL 2019, Delhi Weather & Pitch Report: Here's How the Weather Will Behave for Indian Premier League 12's Match Between Delhi Capitals and Sunrisers Hyderabad. Sunrisers Hyderabad Playing XI: David Warner, Jonny Bairstow, Vijay Shankar, Manish Pandey, Yusuf Pathan, Mohammad Nabi, Deepak Hooda, Rashid Khan, Bhuvneshwar Kumar, Siddarth Kaul, Sandeep Sharma.